The Brazee Studios Art gallery, tucked away in the suburb of Oakley, is currently featuring the well paired work of painter M. Katherine Hurley and sculptress Margot Gotoff. Hurley’s big sky motifs in dramatic color dominate the main room. The viewer’s vantage points are varied: sometimes earthbound sometimes mid-flight, atmospherically enveloped in the cloud cover. She shows multiple versions of tumultuous clouds and fiery sunsets, glowering over darkened, silent land mass. One or two canvases present a partially viewable earth, occasionally visible through the sheltering cloud layer while the larger open air space beckons. One painting even portrays the curve of the earth from some point airborne. A 20 panel wall installation, each approximately 12 x12, hints as an assemblage at sunset in riverscape and sets off the wall at the end of the room. This new approach in Hurley’s oeuvre employs a range of heated palette colors in the upper 2 tiers, largely oranges and yellows. The bottom tier is a series of seasonally inspired earth tones. Above this, through the third tier a river flows, picking up a reflection of the sunglow above. 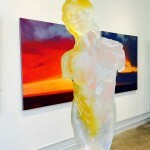 Margot Gotoff’s fragmented figurative pieces pair well with Hurley’s coloratura work. Gotoff celebrates the female form in cast glass from clay or wax originals. Fully formed heads on some works tend to push too much in the direction of identity, while partially presented facial planes relate more appropriately to the general abstraction. Gotoff casts variably with tinted and frosted glass. One work has a series of darkly contrasting color chips added on the outside of the form almost as a revealing drape. In another technique, bans of color are flitting through the fragmented torsos. Color elements fused as part of the casting process are well integrated artistically. This technique further emphasizes the sculptural abstract aspect of the pieces and appeals to this writer. The Butler Art Institute of American Art, Youngstown, Ohio, regularly exhibits nationally noted artists in the Davis Gallery. Currently featured is the remarkable Rhoda Sherbell, of Westbury, New York, featured instructor at the New York Art Students League. 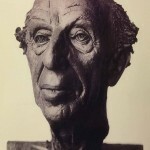 Sherbell, whose portrait commissions range from Yogi Berra in the Baseball Hall of Fame, Cooperstown, to the great American composer Aaron Copland, treats us to several examples of her cast bronze works as well as a series of masks celebrating the nature and spirit of woman. Portrayed in all her revelations, mysterious, spiritual, sometimes intuitive and natural and often unpredictable, Sherbell’s masks revel in the exotic, employing a variety of cast jewelry, shells, bones and feathers. Contrast this with the stately full figure bronze of Queen Katherine of England, displaying intricate detailing in clothing, crown and jewelry. The gesture and movement of these works deny the fact that they are cast in heavy unyielding bronze. The permanent collection includes several must see works and is well worth putting on your agenda if you haven’t visited.